We don't see a lot of Exynos chips shipping in Samsung phones in the US, but the rest of the world is swimming in devices running Samsung's in-house ARM chip. 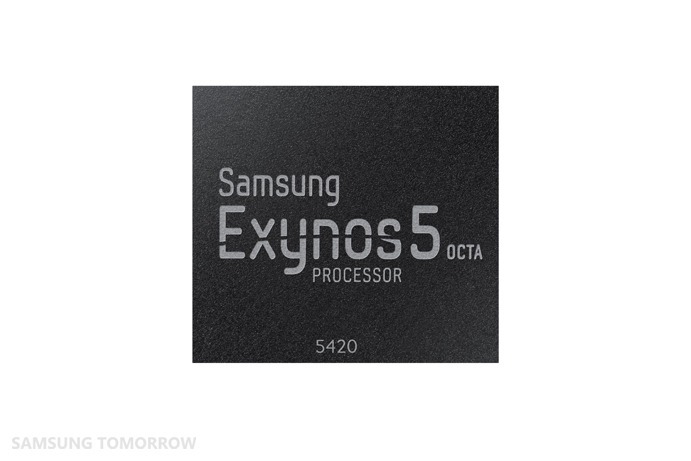 The Exynos 5 Octa (5410) debuted in the Galaxy S4, and now an updated version of that chip known internally as the Exynos 5420 has been officially announced. Like the older Exynos 5 Octa chip, the 5420 has eight total cores that leverage ARM's big.LITTLE design. That means four full-power ARM Cortex-A15 cores clocked at 1.8GHz, and four Cortex-A7 cores clocked at 1.3GHz. The combination offers more processing power and lower battery usage than running only A15 cores. Samsung claims optimizations in the 5420 have allowed for a 20% increase in CPU performance over the old chip. The 5420 also packs dual-channel LPDDR3 at 933MHz for super-wide memory bandwidth. The big difference between the 5410 and 5420 is the GPU. Samsung has moved from the PowerVR SGX544MP3, to a Mali T628 MP6 (that's six cores). The new GPU has roughly twice the graphical power of the PowerVR in the 5410, and it fully supports OpenGL ES 3.0 and Full Profile Open CL 1.1. The T628 also allows for GPU computing to accelerate complex operations usually handled by application processors. The new Exynos is being shopped around to vendors, and won't show up in devices for a while yet. Production is set to ramp up in August, so maybe Samsung's next round of phones will run on the new Octa.